Octant was designed by Christian Thalmann. 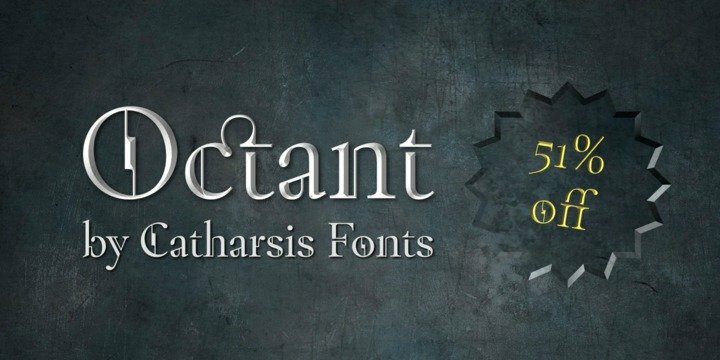 Octant font is a typeface font. Its overall shape is based on the familiar timeless proportions of humanist serif tradition, which renders it easily legible. Thanks to its unique and unmistakable look, it delivers a memorable impact in any role. Octant comes with extensive language support and a generous collection of ligatures. For ease of use in typographically unsavvy applications (such as PowerPoint), the distribution includes an alternate version of the font (“Octant Ligatures”) in which all ligatures are encoded as standard rather than discretionary.